A New York Times article today spotlights the new High Line park built atop an elevated rail line in Manhattan. The High Line offers a retreat from street life, a bucolic space floating 30 feet in the air with Hudson River views. Yet it retains many elements of its gritty past: graffiti is prevalent on the buildings it wends through, and some of the rails have been restored in the park. That the park — which grew from an idea hatched 10 years ago into a $170 million project —is being built at all is a marvel. “When we first started people thought it was crazy,” said Robert Hammond, a co-founder of Friends of the High Line, the community group that pushed for the park. No longer. The first section of the park will open to the public this spring, but it has already transformed the area near its 22-block stretch near the river, prompting some of the most ambitious development in the city in years. The park in the sky is attracting several new developments, including offices and buildings along its stretch. Th benefits of turning former industrial rail viaducts into parks is exciting and evident. Other cities are doing the same thing. 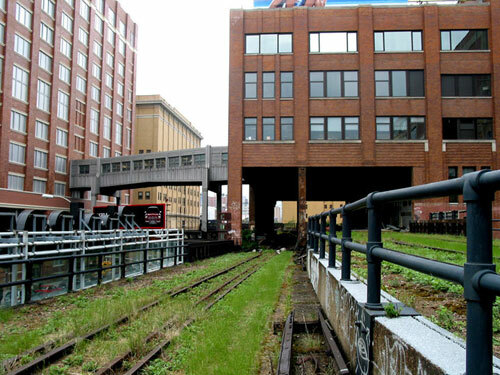 In Chicago, the Bloomingdale trail contains an elevated rail segment. Here’s some more info on that project. And then there’s another segment in St. Louis that the Great Rivers Greenway District is developing. We hope to post more on both of these projects more in depth. The High Line project is one of the coolest projects around. I can’t wait to get there and check it out in person. Yeah – I particularly like the fact that graffiti is being kept on the adjacent buildings and some of the tracks remaining intact.